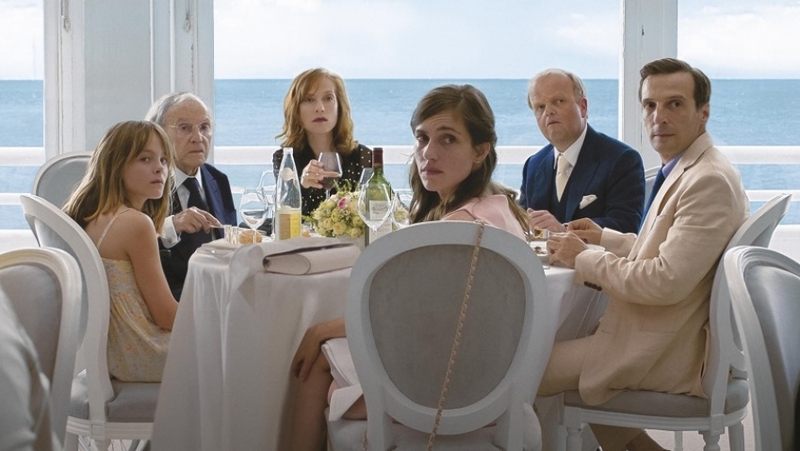 It’s not like a François Ozon movie, Haneke is different. Happy End is a work typical of Haneke. The Director is famous for movies with a very powerful and complex message although it doesn’t need much dialogue. The camera angles show a natural view from the everyday perspective of a ordinary person. Scene1: You see only Eve’s mobile phone screen as she observes her mother through the camera, running commentary is displayed in the lower part of the screen as text. Scene 2: A building site on a sunny day. Again, the viewpoint is that of a camera, this time however it seems to be a CCTV-camera. In the top right is a time stamp showing 07.43 am. Everything looks peaceful, it’s a perfectly normal day on a building site, one minute later on the site of construction area collapses. Scene 3: A family is having dinner. Three generations sitting at a table are being served by household staff. These scenes have nothing in common sum up the whole movie. Anne (Isabelle Huppert) is a woman who is trying to run the family business and at the same time trying to understand what’s going on in her sons mind and plan her wedding. Son Pierre (Franz Rogowski) seems to be interested neither in running the family business nor in anything or anyone else. He finds release in expressive dancing and singing on a stage. He uses every family gathering, be it the 85th birthday of his grandfather Georges (Jean-Louis Trintignant) or his mother’s wedding, as an opportunity to bring up the injustice and unequal distribution of money and tests the limit of his relationship with his mother. At the end you see Eve (‘s view) again just like in the opening scene. This time she is watching her grandfather on her phone through the camera. He has no regrets as he moves towards the ocean. The unsettling part is the smiling emoji in the place of the camera button.